Join us in big sky Montana for a lived experience in Natural Leadership where you will identify, clarify and claim your natural ability to lead. We will leave life and work’s familiar routine, complexity and technology to retreat into the clear open space of the natural world and the rich interior of our inner world. Take the lead for an unforgettable experience in which you will create sustainable leadership and life changes. You were born a natural leader trusting your senses and responding in an authentic and natural way. Natural leadership begins with you being uniquely you and leading truer to your nature. Integral to the mastery of your natural leadership potential is the capacity to be in alignment with who you are, the values you embody and the actions you take in creative, adaptive and resourceful relationship with your life and work world. In this time of complexity, rapid change and instability it is essential that you balance the vast technological resources and information from the outer world with instinct, inner knowing and authentic relationship. You will take away powerful insights, critical thinking skills, solution focused strategies and innovative leadership skills as a result of real time discoveries that are relevant to real life situations. Hiking to find the spirited herd of horses, we walk into our natural leadership, encountering the horse herd we learn relational integrity . Exploring the wealth of our inner world we experience the ancient Shaman Bear cave. A day of personal quest and focused attention, an opportunity to expand our vision and reflect on commitments within the peace and beauty of the atural world. Exploring the challenging territory of commitments under the Big Sky of Montana. The Natural Leadership retreat offers the possibility of sustainable leadership and life changes. Included at no extra is a series of coaching sessions, before, during and after the retreat with your retreat facilitators Herb and Jackie Stevenson. Your pre retreat coaching session will include a discussion of your personal intentions for this retreat as well as an initial interview to begin the process of your individual coaching report, CPI 260 Report for those that chose to complete it. Each participant will receive three, one-hour coaching sessions as part of this retreat. You will also have the opportunity for peer coaching opportunities with the retreat participants. During the retreat, exercises will be done to support the participants to expand their understanding to discover possible steps for further enhancing their leadership skills. From these exercises the participants will be supported to create a developmental plan that will be their “take home”. For some, these plans will be detailed and focused. For others, the plan may be a single issue that is a guiding principle for how to perform upon the return home. After the retreat, each participant will receive two more, one-hour coaching sessions. These sessions will be to support the participants to work their plan and adjust where necessary. We are committed to lasting results. During and after the retreat we will help you integrate what you are experiencing and its relevance to you as a Natural leader in your professional and personal life. Each participant will have the opportunity to complete a Spectrum CPI 260 for leadership on-line prior to the retreat. Building on the exceptional 50-year history, validity, and reliability of the California Psychological Inventory™ (CPI™) instrument, the CPI 260™ assessment opens a new window into people's strengths and opportunities for development, offering a vibrant portrait of the individual as seen through the eyes of others. Ideal for one-on-one coaching or any performance improvement initiative, this powerful, business-focused assessment is one of today's most popular leadership development. Its 260 carefully selected items measure more than two dozen scales in five areas and suggest targets for further development in interpersonal behavior, social and personal values, cognitive needs and performance, and personal and work-related characteristics. Based on questionnaires that have been used and validated in a wide variety of management and leadership development programs, results are highly predictive of managerial competencies. An individual's responses to the Spectrum CPI 260 instrument are compared to responses from a large number of experienced men and women executives, successful individuals, who are "on track" for continued success and advancement. The Coaching Report for Leaders offers insight into your particular strengths and areas for potential development in 18 leadership characteristics, organized into the following core performance areas: Self-Management; Organization and Planning; Team Building and Teamwork; Problem Solving; and Sustaining the Vision. The final section of the report offers advice on planning the next steps of an individual's leadership development path. 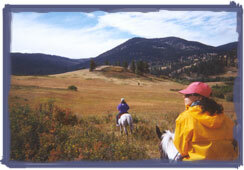 The Blacktail Ranch has been providing quality accommodations for vacation packages since 1950. They have been continually upgrading and building to house the number of guests who have found their way to our door. Your retreat includes sleeping rooms in the main lodge fondly called "The Barn." We will be cozy with two people to a room and three large bath rooms to accommodate these rooms. You can also choose a single room or private cabin.The Black Tail Ranch offers four one bedroom cabins, three of which have jacuzzi tubs, a large two bedroom cabin with a sleeping loft, all these cabins are furnished with full private baths and private decks. All cabins and rooms are beautifully decorated in western ranch motif with many antiques and original ranch furniture. These cabins, private rooms or loft are available for an additional $50 per night for those requiring more personal space. 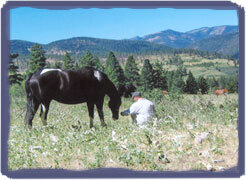 Hiking Trails and wildlife are abundant, offering some very rewarding views and exciting moments. Elk, deer, black bear, plus a large variety of birds including a number of species of hawks and eagles may be seen at any time. In the summer months wildflowers cover the hillsides, casting a rainbow of color in every direction. Bring your hiking boots and camera and experience this beautiful valley we call home. Cave Exploring on the Blacktail dates back to 1946 when "Tag" rediscovered an extensive cavern that is now called the Blacktail Cave. Since then, numerous archaeological discoveries, including evidence of Ice Age man and animals, have been found in this incredible cavern. 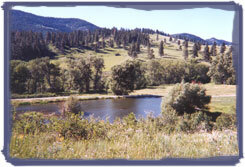 Other sites here on the Blacktail include a Dream Cave, Medicine Wheel, Sun Wheel, and numerous tipi rings. This ranch is rich in Native American and Old West history. The ranch museum contains many artifacts from the cave and ranch, including memorabilia from the homestead era. All of these sites can be toured during your stay. After cave exploring , hiking the miles of trails, bird watching , horseback riding, fishing or just sitting on the front porch they have a hot tub and sauna awaiting you at the end of the day. Also for your relaxing enjoyment you will find a fireplace and satellite television located in the "Barn's" lounge. The Hogan is a hand built community gathering, log structure. It has been built to symbolize the four cardinal directions and the four minor directions. Indigenous cultures refer to such symbolism as medicine wheels. We will meet daily in the hogan to process and debrief. It is open through the retreat for meditation and reflection. The talented and good-natured kitchen staff will prepare three hearty meals a day and are flexible in catering to your dietary preference, vegetarian, low fat, whatever your needs may be. They pride themselves on a fresh, wholesome cuisine serving home made baked goods prepared daily including breads and deserts. They proudly collect fresh herbs daily out of the garden, and no egg ever compared to the golden beauties the spoiled chickens offer every morning. 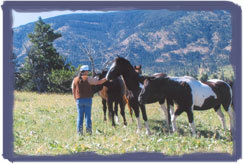 Of course , the Black Tail Ranch raises its own beef and supports organic products. The fee for Discovering Our Way Through Natural Leadership is $3,500 per person. 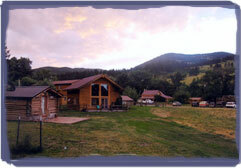 If paid prior to June 15th, there is an early bird discount of $500, making the cost of the retreat $3000. The retreat is Open to 12 participants to allow for individual attention. The fee includes the costs for the retreat, all materials, room and board, transportation from the airport to the ranch and three coaching sessions. You are responsible fro your airfare or land transportation to Great Falls Montana airport. You will be warmly welcomed at the airport by Blacktail ranch hands to assist you with your luggage and bring you to the ranch. If you decide to rent a car we will provide you with easy directions to find your way to the ranch. All participants should fly into the Great Falls, Montana airport. Those arriving July 18th will need to make reservations at one of the several hotels close to the airport. The hotels have courtesy transportation to and from the airport. You will be welcomed and helped with luggage at the airport at approximately 2:00 PM the 19th by the Black Tail Ranch staff. The ride to the ranch will take approximately 1 ½ hours. On the morning of August 24th, the retreat will be closed and the Black Tail Ranch will provide transportation to the airport. No flight departure times should be made prior to 1:00 PM on the 24th. Those departing on the 25th can book a hotel in Great Falls.All other times to and from the ranch will be at the responsibility of the participants via hired transportation and/or rental cars. Jackie Lowe Stevenson , MSSA LISW is a psychotherapist and consultant. She is professional staff member of the Gestalt Institute of Cleveland and of the graduate faculty in the Mandel School of Applied Social Science at the Case Western Reserve University. Jackie lectures and teaches nationally and internationally in Israel, Turkey and Mexico. She is the founder of the nature-based women’s development and leadership program, Wolf Creek, Medicine Women’s Ways. 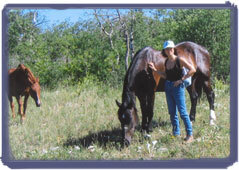 She has incorporated nature, somatic coaching and equine guided education, therapy and coaching , into her work with individuals, families, teams and organizations. Herb Stevenson is President of the Cleveland Consulting Group, Inc. He has been a management consultant for twenty years. He specializes in executive coaching and diversity training. He is listed in eight Who’s Who lists including Who's Who in Finance and Industry, Who’s Who in American Education, and Who's Who in American Law. He is on the postgraduate faculty of the Gestalt Institute of Cleveland, where he is Co-chair of the Organization and Systems Development Center, Becoming a Better Intervener program, the postgraduate faculty of the College of Executive Coaches, which certifies executive coaches in affiliation with the ICF, and the graduate faculty of Cleveland State University’s Diversity Management Master’s degree program. Herb is the founder of the Medicine of Men program that explores men’s development and leadership in today’s world. Call Jackie at 440-338-1752 or e-mail for further information or appointment.